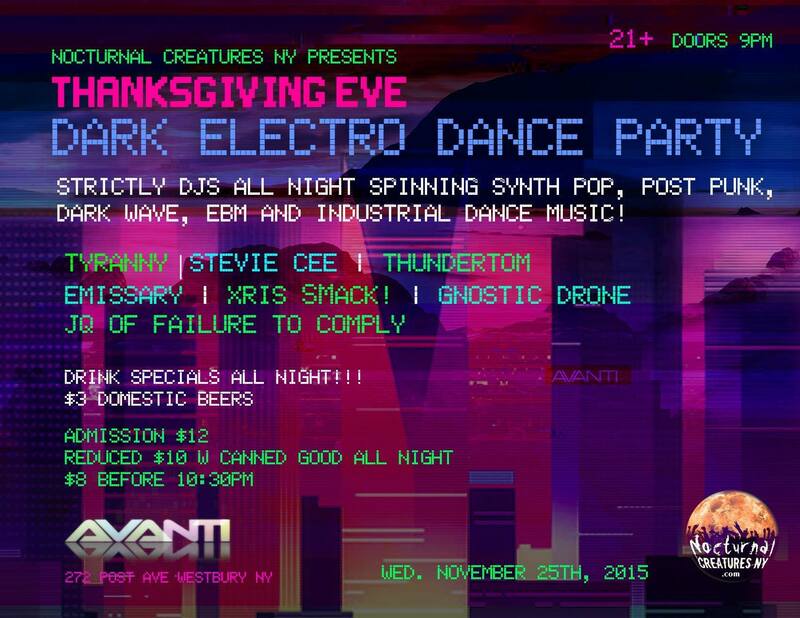 11/25/15 – NOCTURNAL CREATURES – Dark Electro Thanksgiving Eve! NOCTURNAL CREATURES - Dark Electro Thanksgiving Eve! Looking for something different and fun to do on Long Island this Thanksgiving Eve? Strictly Djs all night spinning synth pop, post punk, dark wave, ebm and industrial dance music! Xris SMack! - Stimulate, SMack! We are working closely with particular food pantries to help support families who many be experiencing extreme difficult financial challenges. Your donation will be provided to a family in need! :dark electro, Industrial, New Wave, Nocturnal Creatures, synthpop, Thunder Tom, Xris SMack!